When it comes to an awning for your home or business, you can’t afford to settle for substandard materials – and you don’t want to use any fabric or part that looks less than great. Belle Isle Awning goes to great lengths to find and stock only the highest quality, most durable and most appealing products, fabrics and component parts. That ensures that your finished project is rugged, reliable, and great looking – today and tomorrow. Not all fabrics are created equal. You want your awning to be built from durable, weather-resistant material that keeps looking great year after year – and that’s the only kind we sell. Different awning styles have different requirements with regard to thickness, weight, elasticity, and water resistance. We’ll make sure that your awning is made from the right fabric for your particular needs. Your home or business has its own particular personality, and we offer a wide assortment of fabric patterns and designs to ensure you find the one that’s “just right” for your style or brand. From bold, attention-grabbing stripes to period styles, chances are we’ve got exactly what you want – and if we don’t have it, we’ll get it. The bindings that hold your awning firmly in place to its frame may not be its most visible element – but they are one of the most important ones. Many of our competitors use cheap, substandard binding materials; some even resort to zip ties, figuring that their customers won’t notice or care. 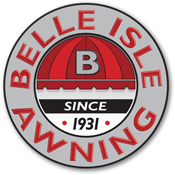 Your Belle Isle Awning installer uses only high-test, weather resistant rope – unbeaten for strength and reliability, season after season.